In between other jobs I have been working on the driver and passenger figures for my Discovery model. I am sure you could buy 3D models for this purpose but as usual I want to do it myself. 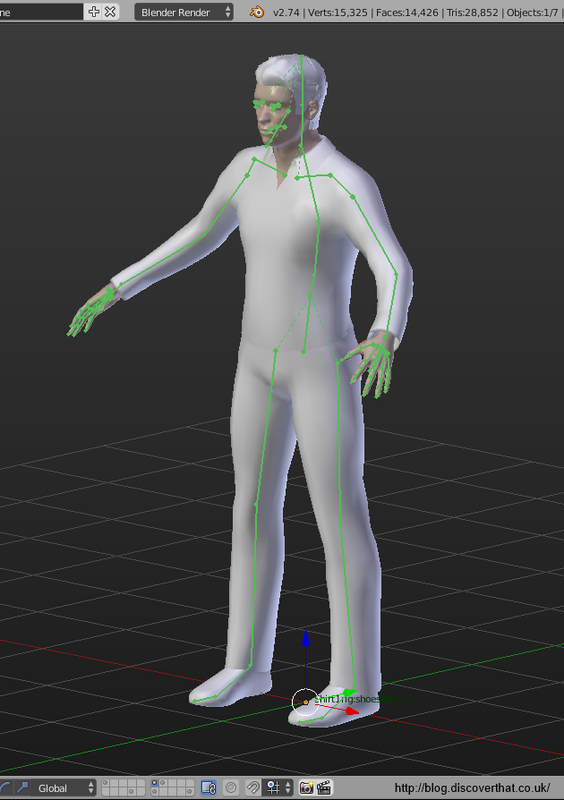 One of the most time consuming parts of creating models is adding the rig to make it possible to pose them. You could try moving the vertices individually or creating the model in the right pose to start with but that takes even more time and more artistic skill. I use a free programme called MakeHuman to simplify the process and it requires very little artistic flare to create people. The posing in Blender still needs a fair bit of technical knowledge so don't think this article will give you all the skills you need to create 3D characters. Bear in mind that the following process is intended to create figures that will be 3D printed at a scale of 1:32. The results may not be suitable for other applications. 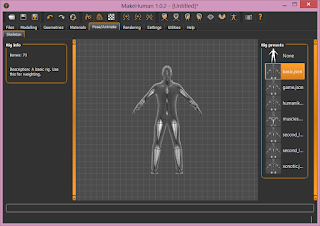 MakeHuman uses simple slide bars and click to select options to shape a human model. It creates people that are male, female and anywhere in between with different builds and body shapes. They start out naked but there is a small selection of clothes. Add clothes and hair by clicking on the selection from the appropriate tab. The bit that makes this much easier is that the model can be exported with a rig and already skinned for use with animation. The rig is the collection of bones or skeleton which you can move and skinning is where the vertices of the model mesh are associated with a bone or bones so that the outer surface moves when the bones are manipulated. The process of skinning is often called weight painting or vertex weights. 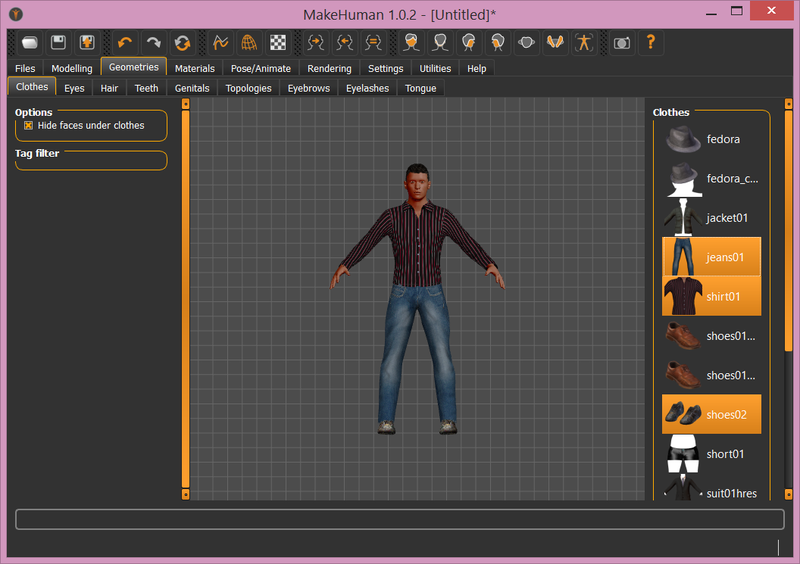 In MakeHuman select the Basic Rig from the 'Pose/Animate' tab. 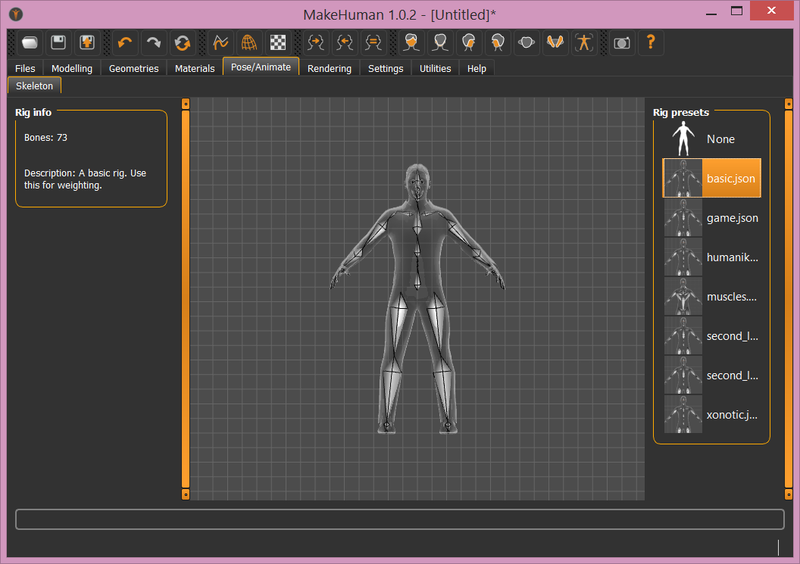 When you are satisfied with the result in MakeHuman it is time to export to Blender. Make sure you also save it. MakeHuman cannot open the files it exports so you must also save it as a MakeHuman file if you want to adjust what you have created at a later date. 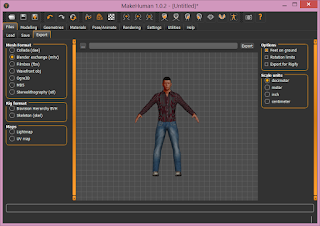 To get the model in to Blender, Export the character and select the 'Blender Exchange (mhx)' format. That will save the model and the rig in a type that can be opened by Blender. 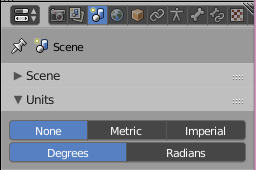 I export with the default scale of Decimeters and adjust that when importing in to Blender. 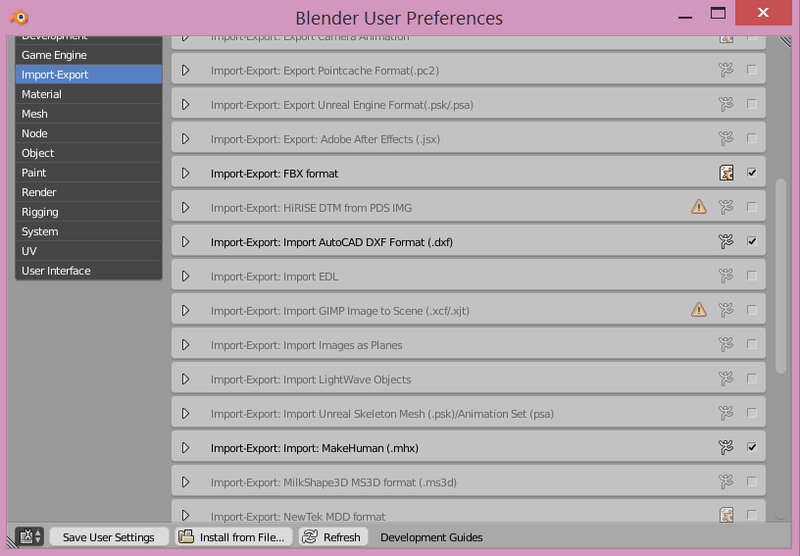 By default the file type for MakeHuman is not shown on the Blender import menu. The MakeHuman type needs to be added in the User Preferences menu, Add-Ons tab. Just tick the appropriate box in the Import-Export list. 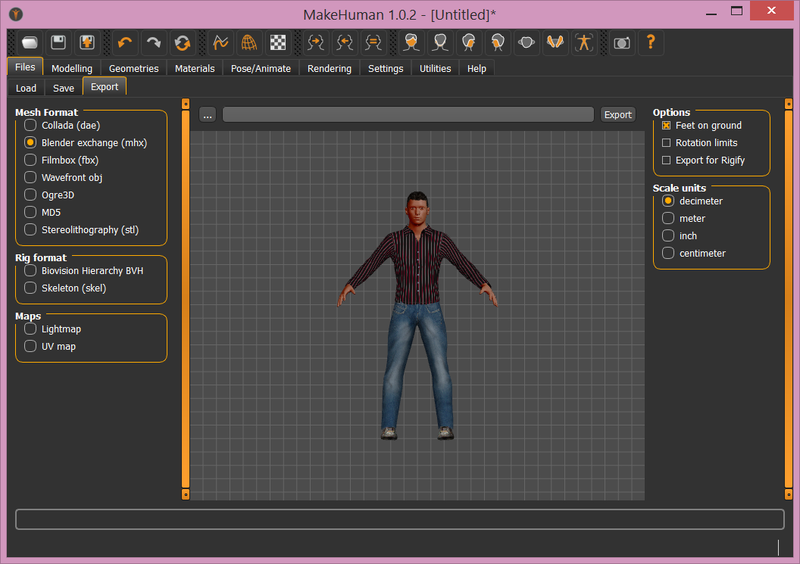 You can then import a MakeHuman file. When importing set the scale to 3.00 and that will import at a nice size for 1:32nd scale figures. 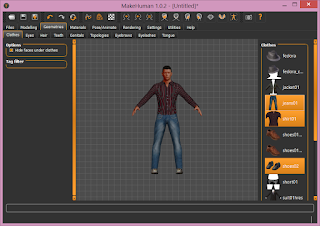 That is if you followed my recommendation above to export from MakeHuman in Decimeters. It also helps if you make sure that you are not using any units in Blender. The Blender units are a nice idea but they hide the true dimensions which can make it difficult when exporting to STL file for use with a 3D printer. 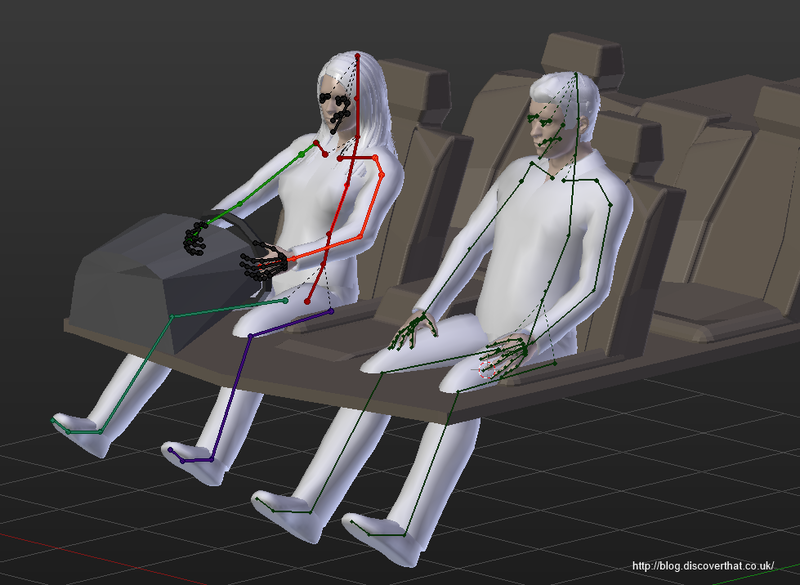 The imported model includes the skeleton ready to animate. That saves a lot of work. I am not going to give a tutorial on Blender animation. That would be for a longer article and there are plenty of tutorials on the Internet. 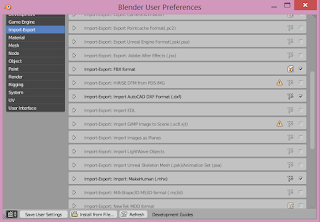 I'm only going to explain the way I use Blender for my particular purpose. 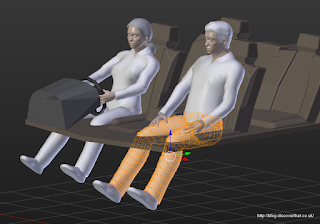 My technique is to append the seating and interior I used for my model car in to the Blend file used to pose the figures. That way I can get them to fit together exactly. In short, I use Blender's 'Pose Mode' to adjust the bones and move them in to position to line up with the seats. It's a little fiddly rotating each bone but not particularly difficult. Once I have them in the pose I like, I need to be able to edit the model to remove unwanted bits and make some style changes. 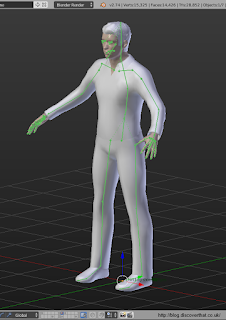 If you try to edit a mesh that is parented to a rig then it will immediately revert to the un-posed (rest) position. It would be a pain to try and work like that. The simple solution is to apply the pose to the mesh. WARNING: Once you have applied the pose you cannot change it using the animation tools any more. SAVE BEFORE applying. 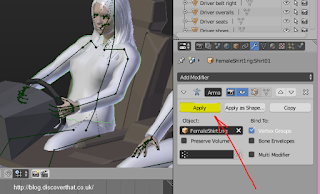 It's a bit of a faff because you have to select each object separately and apply the armature pose from the modifier tool bar. I find that hiding (H) each object as I apply the armature modifier to it helps me keep track of which objects I still need to do. Once done, I delete the rig object because it is no longer attached to the meshes so serves no useful purpose. 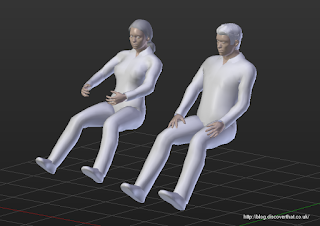 The model figures are now ready to edit. That's as far as I have got but the plan is to remove the unwanted vertices that are lower than the false floor/seat height, make each component solid ready for 3D printing and export to STL file.